This article is about the 1994 Don Bluth film. For the 1992 Golden Films version, see Thumbelina (1992 film). For this film's soundtrack, see Thumbelina (soundtrack). Thumbelina (also known as Hans Christian Andersen's Thumbelina) is a 1994 American animated musical fantasy film directed by Don Bluth and Gary Goldman, based on the book of the same name by Hans Christian Andersen and starring the voices of Jodi Benson, Gary Imhoff and Joe Lynch, with supporting roles from Gino Conforti, Gilbert Gottfried, Carol Channing and John Hurt. Original theatrical release poster by John Alvin. The film was produced by Don Bluth Ireland Ltd., and was released to movie theaters by Warner Bros. Pictures under their Warner Bros. Family Entertainment label on March 30, 1994 in United States and July 29, 1994 in United Kingdom. As of March 20, 2019, the film rights are now owned by Disney through 20th Century Fox, which had obtained the film rights from Warner Bros. in the early-2000s. A lonely widow, longing for a child of her own, is given a barley seed by a good witch. The planted seed grows into a flower, and a tiny girl emerges from inside the blossom, no bigger than the old woman's thumb. The old woman names the tiny girl Thumbelina and raises her as her own. Although Thumbelina loves her mother, she craves companionship from someone her own size. One night, the fairy prince Cornelius stumbles upon Thumbelina after hearing her beautiful singing. The two take a ride on Cornelius' bumblebee and fall in love. During this ride, Mrs. Toad and her son Grundel are enchanted by Thumbelina's singing. Cornelius promises to return the next day, but that night, Mrs. Toad kidnaps Thumbelina from her bed and takes her away to her show boat, where she desires Thumbelina to join their troupe and marry Grundel, who is in love with her. After the toads leave Thumbelina alone on a lily pad to fetch a priest, she is rescued by Jacquimo, a swallow who is infatuated with complicated love stories and encourages Thumbelina to return home. Meanwhile, Cornelius learns of Thumbelina's kidnapping and returns to his kingdom, the Vale of the Fairies, to desperately ask his parents to try holding back the winter as long as they can. Back at the pond, Grundel is told by his two younger brothers Mozo and Gringo that Thumbelina had escaped to find Cornelius, and he ventures out to find her. While trying to get home, Thumbelina is ambushed by Berkeley Beetle, who becomes enamored with her singing and promises to show her the way home if she sings at his Beetle Ball first. She reluctantly complies, but her bug disguise falls off during the concert and she is denounced as ugly, and Beetle rejects her without helping her. Following Thumbelina's exit from the Ball, Beetle is confronted by Grundel and informs him that he let Thumbelina go. When Beetle is told that Thumbelina loves Cornelius, he suggests that Grundel should kidnap Cornelius and use him as bait to lure Thumbelina to him. Grundel coerces Beetle into partnership by removing his wings to ensure his cooperation. Upon the arrival of winter, Cornelius falls into a pond during his search for Thumbelina and is frozen. Thumbelina is forced to take refuge in an old shoe, where she is discovered by Miss Fieldmouse and granted shelter in her underground lair. After relaying Cornelius' fate to Thumbelina, Miss Fieldmouse introduces her to her neighbor Mr. Mole, who is immediately infatuated with Thumbelina and desires to marry her. Thumbelina, devastated by the apparent loss of Cornelius, accepts Mr. Mole's proposal after some persuasion from Miss Fieldmouse. Beetle and Grundel find and abscond with Cornelius' frozen body and subsequently learn of Thumbelina's wedding. When they leave Cornelius behind and embark to Mr. Mole's home, a trio of friendly insects find and thaw Cornelius. At the wedding, Thumbelina finds herself unable to marry Mr. Mole after remembering Cornelius' singing voice and promise to her. Suddenly, Grundel and Beetle appear and a chase ensues. Cornelius also appears and engages Grundel in a fight. Thumbelina escapes her pursuers and meets with Jacquimo, who has found the Vale of the Fairies and takes her there. Thumbelina and Cornelius reunite, and Thumbelina magically grows her own pair of wings upon Cornelius' proposal. Jodi Benson as Thumbelina - A tiny young woman who is not as big as her adoptive mother's thumb, and falls in love with the handsome fairy prince Cornelius. Gary Imhoff as Prince Cornelius - the Prince of the Fairies and Thumbelina's love interest. Gino Conforti as Jacquimo - a wise swallow who speaks with a French accent. He is the partial narrator of the story. Gilbert Gottfried as Berkeley Beetle - a singer beetle who owns his own "beetle band" and a so-called "connoisseur of sweet nectars, a designer of rare threads, and a judge of beautiful women." He is forced by Grundel to help him to find Thumbelina. Carol Channing as Ms. Fieldmouse - a rather greedy yet kind field mouse who takes Thumbelina in from the cold and persuades her to marry Mr. Mole. John Hurt as Mr. Mole - a fabulously wealthy but self-involved and cynical mole who falls in love with Thumbelina after hearing her voice. Barbara Cook as Thumbelina's Mother - the widow who mothers Thumbelina since her birth from a flower. Charo as Mrs. Toad - a gorgeous and famous Spanish singer and mother to her three sons Mozo, Gringo, and Grundel. Tawny Sunshine Glover as Gnatty, one of the jitterbugs. Michael Nunes as Li'l Bee, one of the jitterbugs. Barry Manilow agreed to compose the songs for three Don Bluth pictures. Thumbelina was the first, followed by The Pebble and the Penguin, and the third was canceled. The film's soundtrack was released for a limited time and has since gone out of print. "Marry the Mole" won a Razzie for Worst Original Song. "Let Me Be Your Wings" - Barry Manilow & Debra Byrd/Produced and Arranged by: Robbie Buchanan for Robbie Buchanan, Inc.
Thumbelina was in production from February 1991 to May 1993 at Don Bluth Ireland Ltd. (formerly known as Sullivan Bluth Studios at that time) in Dublin, Ireland, even though principal recording and animation would not begin until early 1992. The film was completed with funds from filmmaker John Boorman and Hong Kong-based Media Assets after Don Bluth Entertainment filed for bankruptcy. It was originally scheduled to be distributed by Metro-Goldwyn-Mayer in North America and J&M Entertainment overseas, and was also originally slated for a Thanksgiving 1993 release in the United States. However, by the time it was completed, both companies dropped the arrangement due to concerns about the bankruptcy of Bluth's studio. Warner Bros. subsequently bought the distribution rights in March 1993, and Thumbelina was released the following year. When released, it was preceded by the Animaniacs short, I'm Mad. The film grossed $11.4 million at the US box office, against a budget of $28 million. Critical response aggregation website Rotten Tomatoes gave the film a 33% approval rating based on 9 reviews, with an average score of 5.2 out of 10. Roger Ebert gave the film two stars out of four, concluding his review "It is difficult to imagine anyone over the age of 12 finding much to enjoy in Thumbelina." It also won a Razzie award in the category of "Worst Original Song" given to "Marry the Mole", sung by the vocal performance of Carol Channing. Warner Home Video released Thumbelina on VHS and LaserDisc on July 26, 1994 in the United States and Canada, and internationally in different countries throughout the 1990s. The film was re-released on VHS in the United Kingdom in March 1995. In December 2001, Thumbelina was re-released on VHS and DVD; by 20th Century Fox Home Entertainment. On March 6, 2012, Thumbelina was released on Blu-ray. ^ Dawtrey, Merlin's magic may animate DBE. 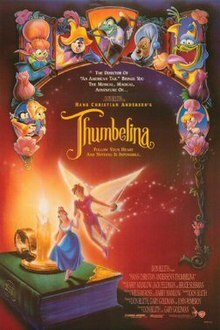 ^ "Thumbelina (1994) - Box Office Mojo". boxofficemojo.com. Retrieved 2 November 2015. ^ "Thumbelina". rottentomatoes.com. 30 March 1994. Retrieved 2 November 2015. ^ Ebert, Roger. "Hans Christian Andersen's Thumbelina". Chicago Sun-Times. ^ "1994 RAZZIE Nominees & "Winners"". Razzies.com. The Golden Raspberry Award Foundation. 2005-12-04. Archived from the original on 2009-08-22. Retrieved 2008-06-07.